Hockney, David, Secret Knowledge: Rediscovering the Lost Techniques of the Old Masters, 2006, ISBN 0-14-200512-6 (New and Expanded Edition). 328 pages. index. list of illustrations. bibliography. 'textual evidence' section cites Alhazen 240, 242, 277, 279, 284. Entire book records Hockney's investigation of the camera obscura and his rediscovery of its use in portraiture. 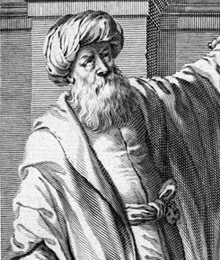 Sabra, A. I., The astronomical origin of Ibn al-Haytham’s concept of experiment, Actes du XIIe congrès international d’histoire des sciences (Albert Blanchard, Paris), 1971, 3: 133–136 . Reprinted in Sabra, A. I., Optics, Astronomy and Logic: Studies in Arabic Science and Philosophy, Collected Studies Series 444, Variorum, Aldershot, 1994, ISBN 0-86078-435-5, OCLC 29847104 30739740 .